The dimensions of Ecocapsule are ( H x L x W ) 2.55 × 4.45 × 2.25m/4.5m with extended pole and its installed power output is 750Wfor wind and 600W for solar with a 9744Wh battery in place. 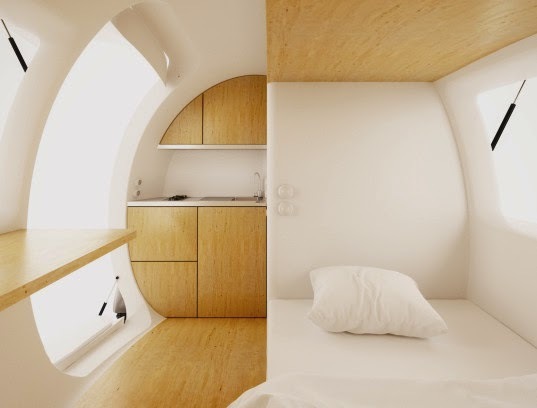 “Ecocapsule is a low-energy house packed into a compact form. It merges an energy efficient shape, compact volume and off-grid capabilities with the luxuries of a warm bed, running water and a hot meal. Even though small in size, each Ecocapsule comfortably houses two adults. Its efficient spatial layout allows you to enjoy convenience of household facilities in off-grid conditions. Built-in kitchenette with running water, flushing toilet and hot shower are luxuries of a hotel room that are now also available in wilderness. Plenty of storage space also fits all your sport or research equipment.